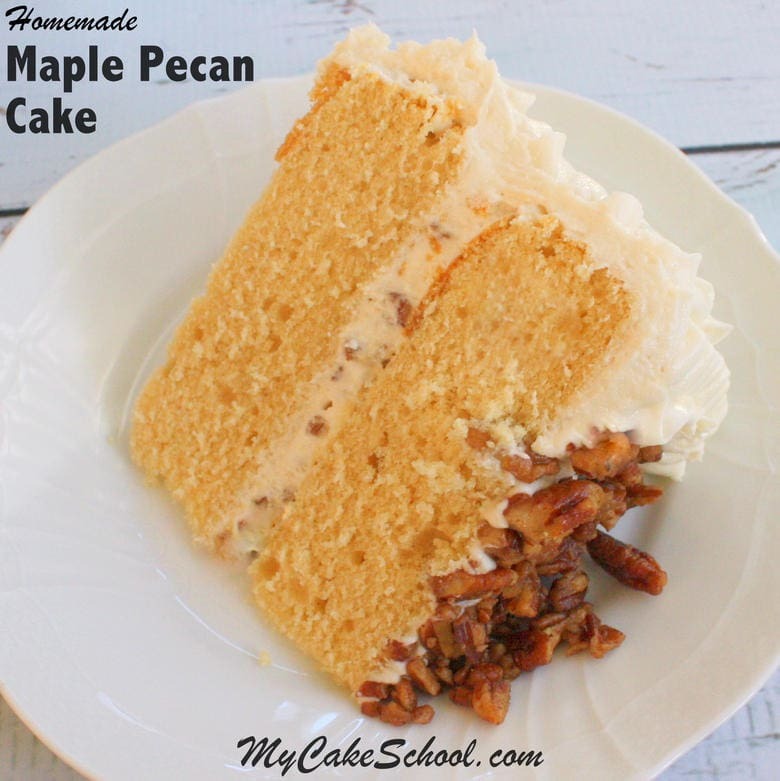 I LOVE this moist and delicious Maple Pecan Cake. It is a fantastic go-to recipe no matter what time of year, but I make it most often in the fall when my maple and pecan cravings are highest! These maple cake layers not only taste amazing, but they are sturdy enough for fondant and this recipe is perfect for cupcakes! I love the versatility! Maple and pecan are such a satisfying combination of flavors, especially when those pecans are coated with a heavenly maple glaze. Ahhhhh. We’ve used them for a delicious topping and crushed them into the filling for an added flavor boost and a little crunch. Another star of this cake is the Maple Pecan Buttercream. This simple and deliciously dreamy frosting is a must for your recipe file (especially your fall favorites), and is SO simple to make! We hope that you enjoy this homemade recipe as much as we have! Add chopped pecans and stir until pecans are coated. Spread pecans on baking sheet and bake for 8 minutes. Remove from oven and put into medium sized bowl. In a small bowl, mix together the 2 additional tablespoons maple syrup and 1/2 teaspoon maple extract. Pour over pecans and stir to coat. In a medium sized bowl whisk together the flour, baking powder and salt and set aside. In another bowl combine the milk, sour cream, vanilla and maple extract. Blend with a fork and set aside. In the bowl of your mixer beat the butter until smooth. With the mixer on medium speed slowly add the sugar and mix 4 to 5 minutes. Add the eggs one at a time, mixing after each egg until no streaks of egg yolk color remains. Pour into 2 greased and floured 8 inch round pans. Bake at 350 degrees for 30 to 35 minutes or until a toothpick inserted in the center comes out clean. Let the cake layers cool in the pans 10 to15 minutes then turn out. Cream the softened butter until smooth, blend in the flavorings. Add half of the powdered sugar and most of the milk. Beat at medium speed until the powdered sugar is incorporated. Add the remaining powdered sugar and milk and mix at medium speed another 3 to 4 minutes, scraping the sides of the bowl occasionally. Slow down the mixer to the lowest speed during the last minute of mixing to help eliminate air pockets in the buttercream. The texture will become very smooth. This is a crusting buttercream. Reserve a small bowl of frosting for your desired amount of filling. Stir in your desired amount of maple glazed pecans. Assemble the layers. Frost the cake (we piped ruffles with a tip 104). Use the remaining glazed pecans as topping for the cake. Sounds delicious! I’ll print that and see if I can make it GF! What is a scratch recipe please. So sorry for my ignorance. Rhoda. Even my eyes are watering after looking at this :) I must try this one asap. I tried something similar once using peanuts. Hi Melissa, that will make this beautiful cake chip chocotale can paste the drops with chocolate Brigadier? Hi Paloma, You could add more salt (l teaspoon) to cut the sweetness of the icing. Cream cheese icing with maple extract would also be very good with this recipe. This sounds so good! Thank you. However, I live in France. I have maple syrup, but maple extract is not available. Do you have a suggestion for a substitute or way around it? Thanks! Hi, can i use this recipe for cupcakes? Hi Jing, Yes, it will be fine for cupcakes. Bake at 350 degrees for 18 to 20 minutes. can you double this recipe? Hi Marcia, You should be able to double the recipe with no problem. Should there be maple extract in the frosting? Hi Emma, yes there is maple extract in the frosting. 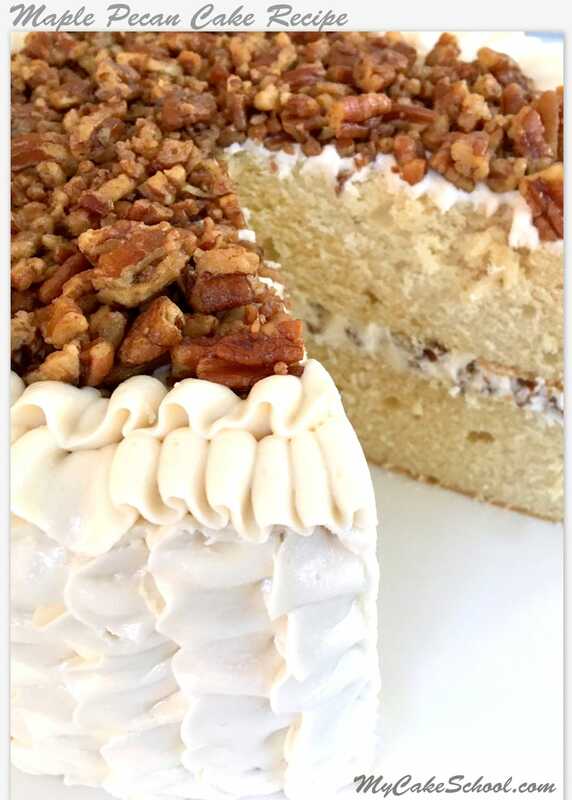 Could you use salted butter on the pecans and in the frosting to cut the sweetness a bit? Hi Melissa, Yes, it will be fine to do that. Hope you enjoy the recipe. Melissa can this cake be frozen? Can use buttermilk for this instead of milk and sour cream?